Many choral musicians around the world remember Jester Hairston fondly. Descended from plantation slaves, he rose from rural poverty in North Carolina to become a widely recognized songwriter, arranger (mainly of spirituals), singer, choral director, and film actor. He wrote Mary’s boy child in 1956, and it immediately became a No 1 hit in a recording by Harry Belafonte. 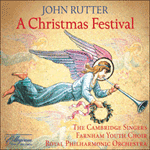 The relaxed gracefulness of its melody and aptly unadorned retelling of the Christmas story in its lyric have gained it a lasting place in the repertoire. The music seemed to come from afar. Mary’s little boy was born.